HomeHome30 for 30: Are We looking at two or more 30-goal scorers this season? 30 for 30: Are We looking at two or more 30-goal scorers this season? In just five days the new hockey season begins. For the New York Islanders, there are many questions that they will face in 2017-18. After missing the playoffs for the first time since the 2013-14 campaign, the expectations are still high for the Isles. With an entirely new coaching staff and new blood ready to make an impact, this season could be something special, or the final chapter before major changes is made. Our Rob Taub will give his thoughts on what to look for from the blue and orange this season. The New York Islanders can score goals. Over the past four seasons, the stats have spoken for themselves. The Islanders have been in the top-10 in goals scored twice and top-ten in goals per game twice. The lowest they finished in those two categories was the 2013-14 season when they finished 17th overall. Other than that, the teams’ offense has been one of the strongest in the NHL for a while. Another impressive statistic from those four years, the Isles have only had three 30-goal scorers in the period — John Tavares with two and Anders Lee with one. Only having two 30-goal scorers in a four-year period and still having an offense finish near the top each season, speaks to how deep the team is at forward. But this season, there’s a distinct possibility the Islanders could have multiple players who reach the 30-goal plateau. Anders Lee recorded a 34-goal campaign a year ago, and there’s no reason he can’t do it again. He has a year under his belt playing next to John Tavares, plus his specific role on the power play, and Jordan Eberle — another playmaker joining the first line to feed him the puck. John Tavares and Jordan Eberle could also score 30 this season. Both have eclipsed the mark more than twice in their career. And now that they are playing together on a line and their chemistry from when they were in juniors, it makes the possibility even stronger. Brock Nelson must, and I mean, must score 30 goals this season. He’s scored 20, 26, and 20 goals over the last three seasons, but if he shows more consistency, 30 goals should be the minimum of how much he produces. Nelson has one of the more deadly shots on the club, and by the look of how he played in the preseason, he looks like he’ll be less hesitant to shoot this season. Josh Ho-Sang’s gifted passing ability will also help Nelson increase his goal-scoring by opening up more lanes for Brock. Andrew Ladd has the feel of a dark-horse candidate to score 30. He did score 23 last year after a slow start. And now that he’s fully healthy and more comfortable in his surroundings, a 30-goal season might not be out of the question. Ladd has scored 29, 28, 24, and another 23 goals during his 11-years as pro, so that bodes well for the possibility of him finally hitting the plateau. Josh Ho-Sang and fellow rookie, Mathew Barzal, aren’t “goal-scorers” per se, but both do have the potential to score 30. The two are both gifted offensively, but Barzal slightly more than Ho-Sang in terms of goal scoring. Reason is, because Barzal did score 27 goals one year while in Seattle, and Barzal has a bit more of shoot first mentality than Ho-Sang. The Islanders offense is loaded this year. This team will definitely score a lot of goals this season because of the talent at the forward position. If the Islanders can get multiple players to score 30 or more, they will be in great shape to win a lot of games and become an even more feared team offensively. Prediction: Lee, Tavares, and Nelson all score 30 goals this year. 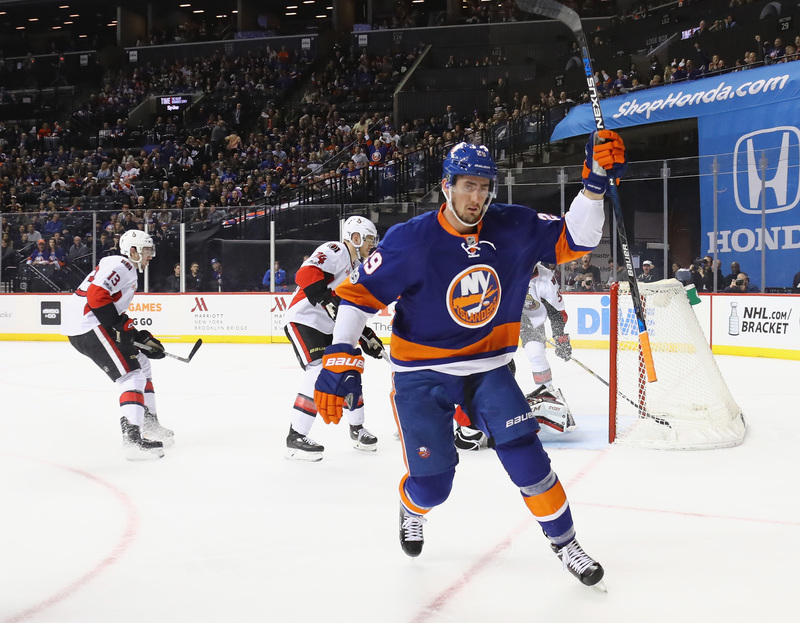 30 for 30: Can Nick Leddy be an All Star this year? 30 for 30: Where will the team stack up in the Metro?